We’ve tried all 66 flavors – have you? 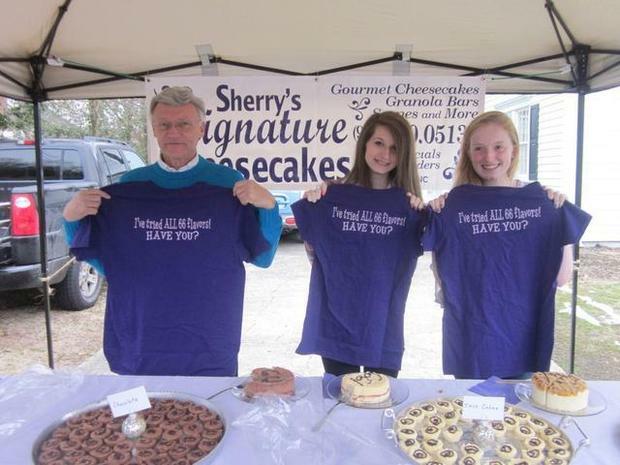 On Feb 1, 2014, we had 3 local people reach a milestone at Sherry’s Signature Cheesecakes! We always are coming up with new tastes and flavors to keep things fresh, and as of that date, we had 66 flavors of cheesecake. On that day, Kate and Rachel Barth and Bill Spencer all finally got to their 66th flavors. 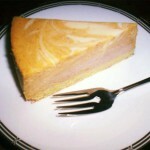 Kate enjoyed the Peaches and Cream, younger sister Rachel finally to to the Irish Cream cheesecake, and Bill got to taste the Chocolate cheesecake as his 66th flavor. In honor of the occasion, each was presented with a commemorative Sherry’s T-shirt AND now have their names engraved on a plaque at the shop. This also prompted Sherry to get cards printed to allow OTHER people to track their progress through all the flavors. Sherry though has now got 1 more added to the mix for a total of 67 flavors. It was a great day and we appreciate everyone that came out for the event! 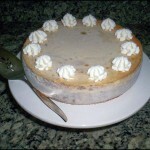 It was great seeing everyone and watching people enjoy some of our different cheesecakes. Stop by and start on your trip through all 67 today! We want to thank all the people that helped us with the event. We’re proud to be part of the Downtown Clayton scene and really appreciate all the people that make our shop so much fun. We’d also like to thank reporter Laura Crosio of the Clayton News-Star for covering our event. You can see her super article here at the Clayton-News Star (Laura, we used one of your pics – hope that’s okay…). 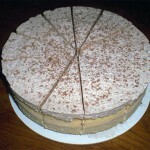 Keep track of us on Facebook at Sherry’s Signature Cheesecakes there.